Filling stations are retail outlets where automobiles are refuelled, lubricated and serviced aside other retail activities, hence it creates few environmental issues. 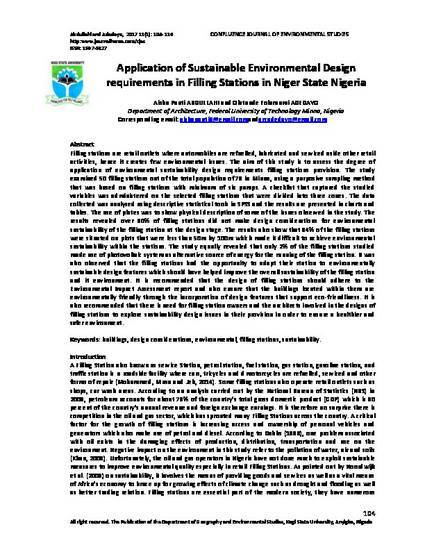 The aim of this study is to assess the degree of application of environmental sustainability design requirements filling stations provision. The study examined 50 filling stations out of the total population of 78 in Minna, using a purposive sampling method that was based on filling stations with minimum of six pumps. A checklist that captured the studied variables was administered on the selected filling stations that were divided into three zones. The data collected was analysed using descriptive statistical tools in SPSS and the results are presented in charts and tables. The use of plates was to show physical description of some of the issues observed in the study. The results revealed over 90% of filling stations did not make design considerations for environmental sustainability of the filling station at the design stage. The results also show that 84% of the filling stations were situated on plots that were less than 50m by 100m which made it difficult to achieve environmental sustainability within the stations. The study equally revealed that only 2% of the filling stations studied made use of photovoltaic system as alternative source of energy for the running of the filling station. It was also observed that the filling stations had the opportunity to adapt their station to environmentally sustainable design features which should have helped improve the overall sustainability of the filling station and it environment. It is recommended that the design of filling stations should adhere to the Environmental Impact Assessment report and also ensure that the buildings located within them are environmentally friendly through the incorporation of design features that support eco-friendliness. It is also recommended that there is need for filling station owners and the architects involved in the designs of filling stations to explore sustainability design issues in their provision in order to ensure a healthier and safer environment.